"You are now the amazing Captain Underpants!!" 20th Century Fox has unveiled an official trailer for the animated Captain Underpants movie, titled in full - Captain Underpants: The First Epic Movie. 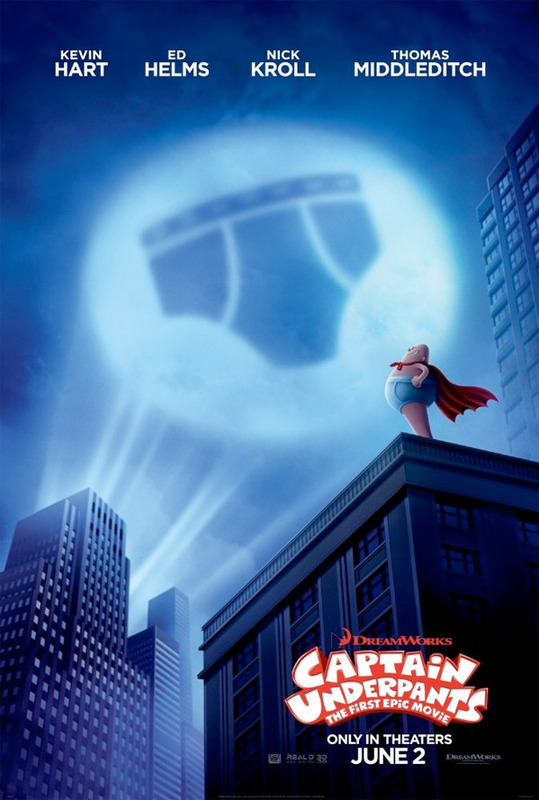 This is based on the very popular books by Dav Pilkey about two mischievous kids who hypnotize their mean elementary school principal and turn him into their comic book creation, the kind-hearted and elastic-banded Captain Underpants. Kevin Hart voices George, and Thomas Middleditch voices Harold, with Ed Helms voicing their principal. Also featuring Nick Kroll, Jordan Peele and Kristen Schaal. As fun as this looks in a few scenes, DreamWorks tends to focus too much on the goofy comedy, and not enough on the story or characters. I'm sure it will be good for kids, but this doesn't seem like the big hit of the summer. Based on the worldwide sensation and bestselling book series, and boasting an A-list cast of comedy superstars headed by Kevin Hart and Ed Helms as the lead voices, DreamWorks Animation brings audiences the long-awaited global movie event, Captain Underpants: The First Epic Movie. This raucously subversive comedy for the entire family tells the story of two overly imaginative pranksters named George and Harold, who hypnotize their principal into thinking he’s a ridiculously enthusiastic, incredibly dimwitted superhero named Captain Underpants. Captain Underpants is directed by filmmaker David Soren, of DreamWorks' Turbo movie previously. The screenplay is written by fellow filmmaker Nicholas Stoller (Storks, The Muppets, Zoolander 2), adapted from Dav Pilkey's popular book series. Fox will release Captain Underpants: The First Epic Movie in theaters starting June 2nd this summer. What do you think?